RELIABILITY: No major faults reported so far but regular specialist servicing is essential. MORE: SEP 1994 New XJ Series: XJ6 3.2, Sovereign 3.2 and 3.2 Sport (all 219 bhp, 5-speed manual or 4-speed automatic); Sovereign 4.0, 4.0 Sport (both 249 bhp) and XJR 4.0 Supercharged (326 bhp), all with 5-speed manual or 4-speed automatic; and XJ12 6.0 (318 bhp, 4-speed automatic). All models have independent suspension, variable rate power assisted steering and anti-lock brakes. 3.2 has steel wheels, other models have alloy wheels. All models have twin airbags, electric windows, heated electric mirrors, remote central locking, 8-speaker audio, front fog lamps, alarm and immobiliser. Sport and XJR have uprated suspension. Sovereign, XJR and XJ12 have air conditioning, electric front seat adjustment and walnut veneer trim, Sovereign and XJ12 have leather upholstery. 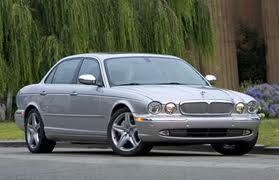 JUN 1995 Long-wheelbase versions of XJ6, Sovereign and XJ12 models available at extra cost. AUG 1995 XJ6 4.0 launched in UK, available as standard Saloon or LWB Saloon at extra cost. APR 1996 XJ Executive 3.2 automatic Saloon launched in UK with climate control, leather seat facings and sports style seats. OCT 1996 All models have restyled 3-seater rear bench seat. 3.2 Sport has automatic climate control. 4.0 Sovereign now has standard LWB body and new 20-spoke alloy wheels. SEP 1997 Revised range: VJ Sport 3.2 V8 and XJ8 3.2 (240 bhp), XJ8 4.0 and Sovereign 4.0 V8 LWB (290 bhp), and XJR 4.0 V8 Supercharged (370 bhp), with more rounded bumpers and grille, 5-speed automatic, alloy wheels, automatic electronic stability control, front side airbags and automatic climate control. XJ8 3.2 and Sovereign have Touring suspension; XJ Sport 3.2, XJ8 4.0 and XJR have Sports suspension (CATS adaptive suspension standard on XJR, optional on other models except Sovereign). 4.0 models have traction control, electric front seats. All models except XJ Sport 3.2 have leather upholstery (sports seats on XJR). SEP 1998 Standard wheelbase 4.0 Sovereign Saloon launched. Revisions: Servotronic II power steering and detailed engine modifications on all models; uprated front disc brakes on 4.0 XJR; Sports suspension option with 16" or 17" alloy wheels on Sovereign.